In the political whirlwind of anger and fear, when racial tensions seethe, let us grapple with the rage felt by Americans betrayed by the promises in the preamble of our Constitution- “We the people…”. In Dr. Kenneth Clark’s 1940s “doll test” experiments children were given dolls identical except for color – one dark brown and one white – and asked to specify a preference. A majority of both black and white children preferred the white doll. Clark argued the findings were evidence that black children believed their society preferred white people. The pervasiveness of white privilege, it seems, is not lost on the young but many white adults deny or struggle with the notion, a truth captured in this artwork. The poignant image of the boy showing preference for a white doll was appropriated from a photograph of Clark’s experiments. The larger figures – the Gray Witches (from Greek mythology) who share but one eye between them – represent willful blindness to evidence of white privilege and a struggle to challenge social norms sustaining inequality and denying true freedom to non-whites in this country. Marginalized groups are continuously fighting for their right to unconditional freedom. A staple of this fight is the freedom of expression, the ability to express how one feels or what one experiences without fear of retaliation. 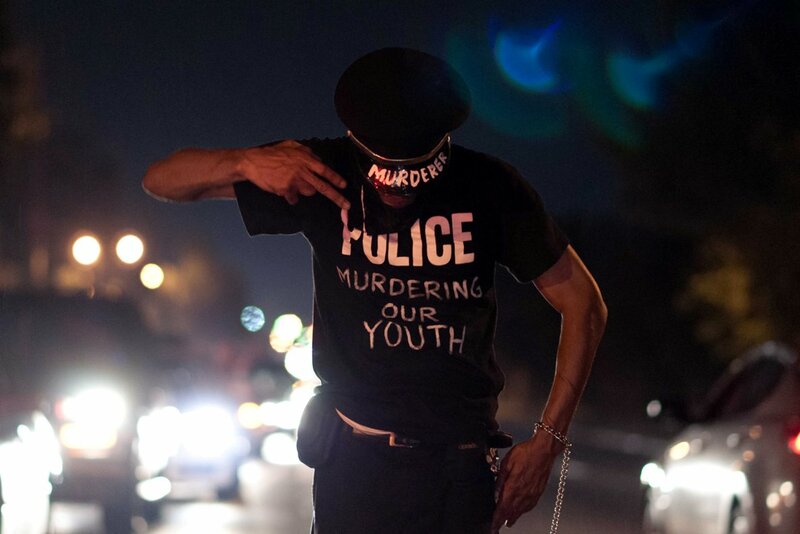 In this image, a man expresses his feelings on how children are the victims of gun violence, not at the hands of criminals but at the hands of police. From adolescence, we are taught that police are the “good guys” that will save you whenever you are in trouble. The reality depicted in this man’s expression is that every police officer is not the officer friendly that we’ve been cultivated to believe in. The freedom of expression in this image is essential because it challenges the comfort of those who don’t experience the same infringement on their freedom and forces them to realize that their reality is not the same reality that everyone in our county experiences. “Super” is an imagined freedom. 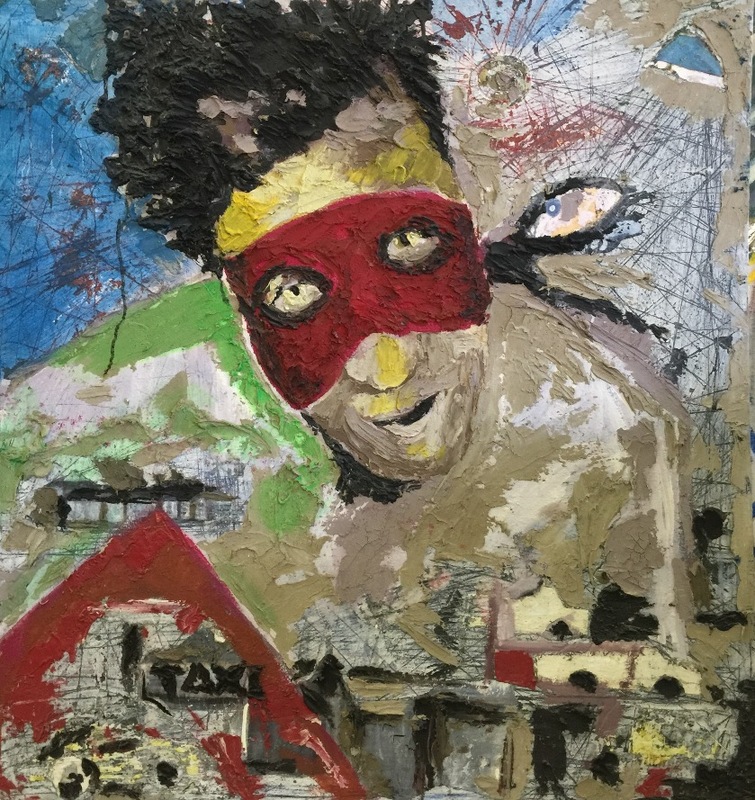 A portrait of a happy black man is depicted as a superhero. As a super hero, he is free from the real suppression and oppression found in cultural institutionalized racism. As a superhero, he doesn’t get stopped by the police just because he happened to let his hair grow a little longer than what is comfortable for the local police. He is happy and free from people who expect him to be homeless or illiterate, when in fact, he has a master’s degree. He is free from the anger that arises in him when people are scared to share the sidewalk with him at night or when he is asked for double the information on the application because he is not economically free from burden. I like the black man as superhero. Everyone enjoys this piece. We do not see that very much. I feel my history has been torn from me. What is we were all to know our true stories…what then? The children are witnessing the truth, not going on what they are told, but what they’re seeing with their own eyes. The truth is the light. The law is not wrong every time. 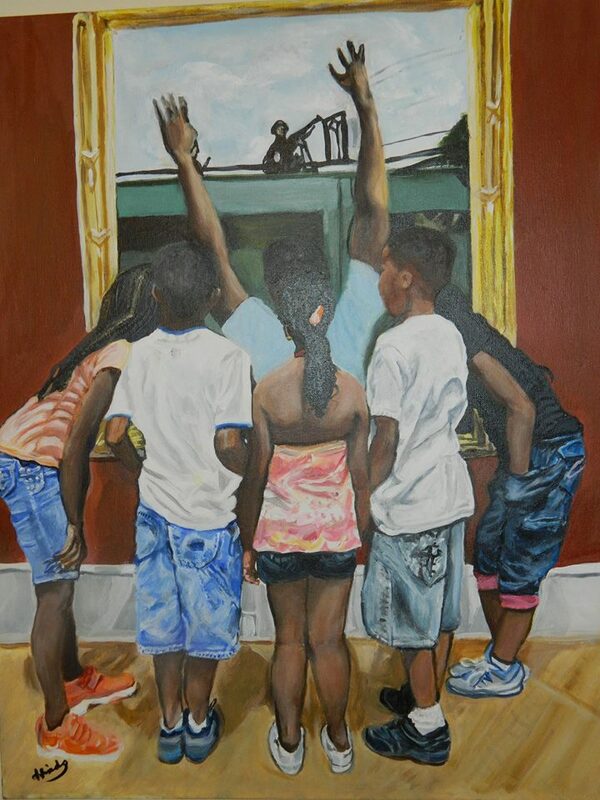 Created shortly after the mass shooting at African Methodist Episcopal Church in Charleston, South Carolina in June 2015 this piece considers the freedom of religion, freedom to assemble, and freedom from tyranny. The first layer is a memorial to the three civil rights activist who were murdered in Mississippi in June 1964: James Chaney, Andrew Goodman and Michael Schwerner. Painted alongside them is Supreme Court Justice Clarence Thomas, who was one of the justices voting down section 4 of the 1965 voting rights act. 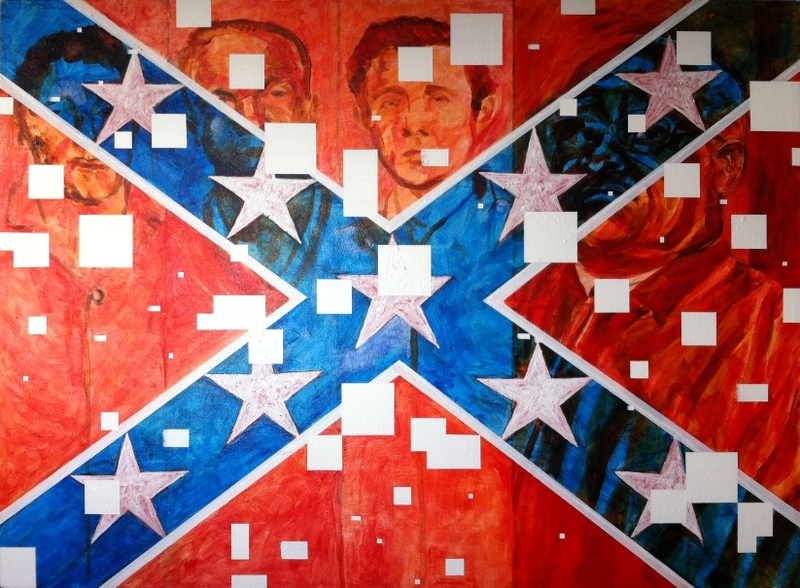 Laid over these loose, transparent images is the Confederate Battle Flag, a tyrannical symbol at the heart of American bigotry. In lieu of 13 stars only nine are present to represent the nine SC dead. The final layer is of nine large white squares that stand for the nine dead and also act as a kind of redaction referring to our ability to whitewash the past. In addition there are numerous smaller squares referring to those whose lives are affected by the loss of loved ones; the impact on a society’s desire for freedom from senseless acts of violence. Glassgold (1900-86) was Director of the WPA Index of American Design project during the 1930’s. At the end of World War II he worked for the Hebrew Immigrant Aid Society (HIAS) in China assisting German Jews who fled to China before the war to escape from Nazi Germany to immigrate to the United States. 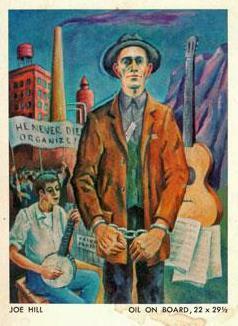 Joe Hill was a union organizer during the 1930, the subject of a famous labor folk song, who was executed by a firing squad in Utah for allegedly inciting insurrection during the course of his union organizing efforts. Builder Levy is a contemporary photographer living in Brooklyn. His artwork concentrates on current social and political social issues, particularly related to the plight of low income workers. This photograph was part of a series chronicling a parade in Memphis, Tennessee on the first anniversary of Martin Luther King’s assassination in that city. 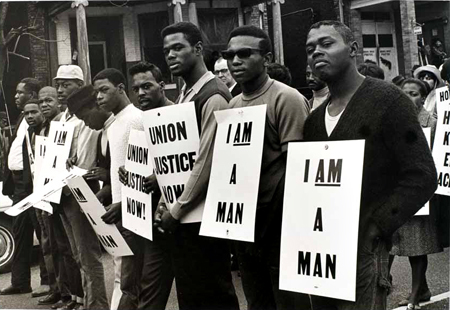 King was in Memphis to assist union efforts to achieve bargaining rights for union workers and the elimination of racial discrimination. Rae was a N.J. artist (deceased 2006) who concentrated her art on feminist issues. 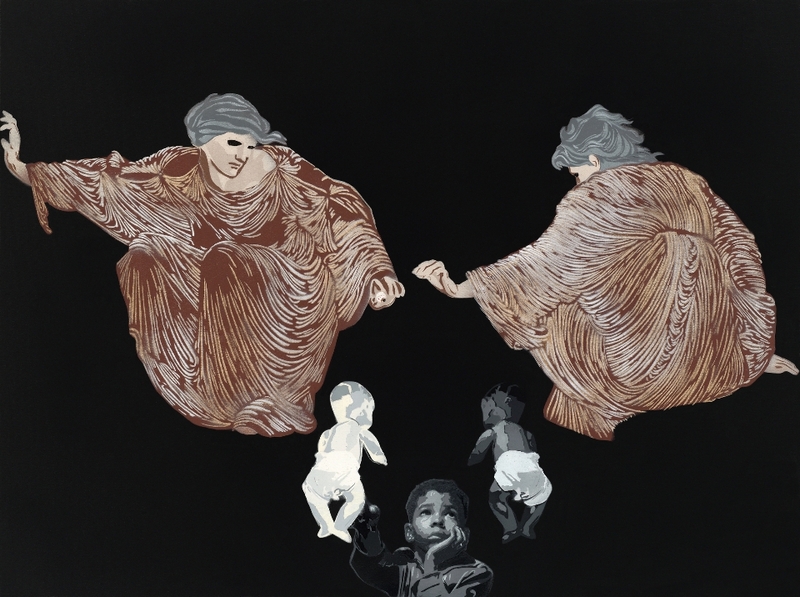 This print was exhibited in the “Expressions of Womanhood” exhibit sponsored by the St. Louis Artists Guild. The print suggests that different job titles for the same work performed by men and women is part of a pattern that results in pay inequality for women. Throughout history, women have played a prominent role in the advancement of many social causes that are intended to grant freedoms to both men and women equally. Regardless of whether or not women are the initiators of a movement, women fight equally, and sometimes harder, to accomplish the freedom that has been sought. With men commonly appearing as the leaders of many efforts throughout U.S. history the significant presence of women is often under-documented, the exception being efforts that are exclusively related to women. 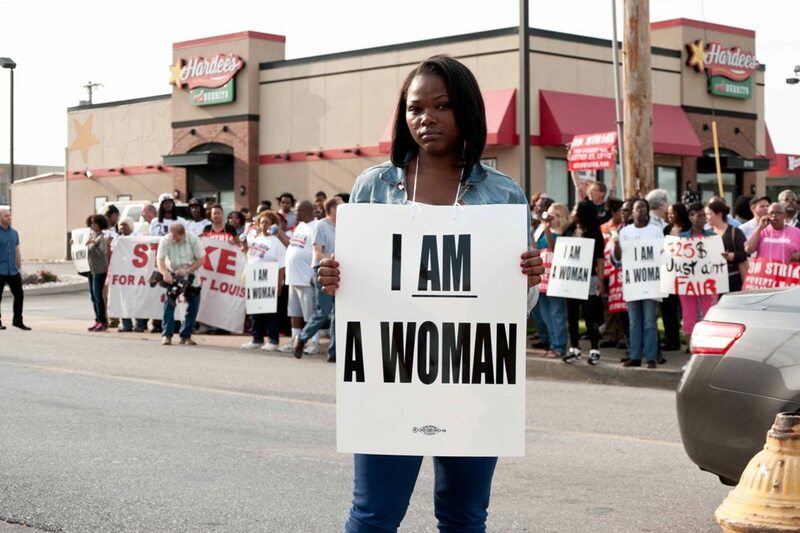 In my experience documenting the Show Me $15 campaign, I took notice of how prominent women were in demonstrations that were held. Women participated in organizing the demonstrations as well as leading demonstrators on the front line. The fight for freedom is a collaborative effort between both genders in which the fruits of the struggle should be enjoyed equally by all. 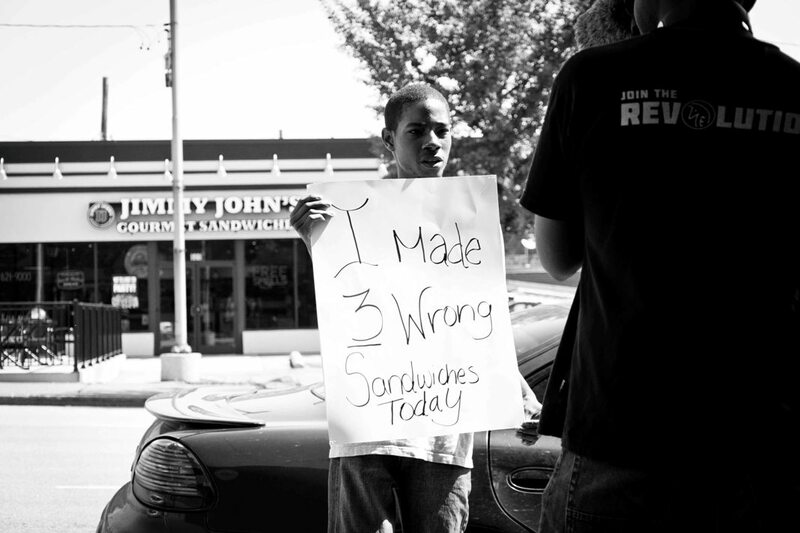 Rasheen Aldridge holds up a sign and explains to a videographer how his manager at Jimmy Johns forced employees to stand in the store holding signs whenever they made mistakes on the job. The sign that Aldridge holds depicts that he was punished for making three sandwiches incorrectly. Forcing employees to hold up these signs in front of customers was a degrading practice adopted by the manager. As an employee, you are a representative for a company while on the clock. The employee adorns the company’s uniform, advocates for the brand and its products, and works towards the greater good of the company. However, at no point does a company own an employee’s dignity. 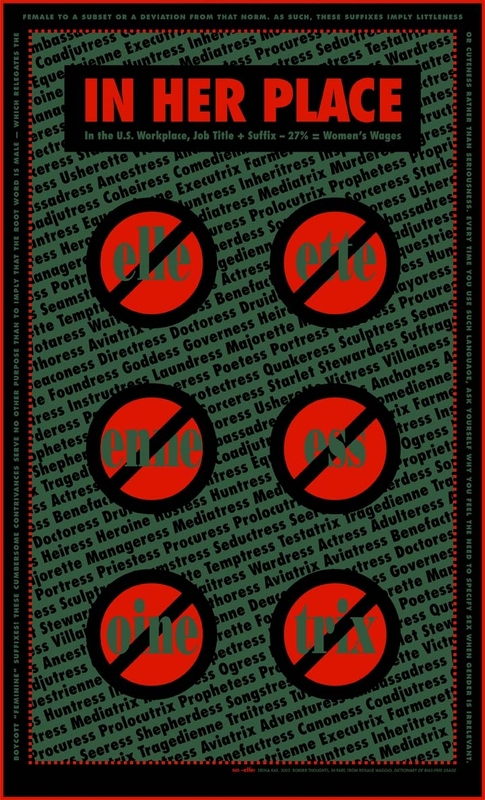 All citizens of the United States are entitled to a sense of dignity regardless of their occupation, gender, ethnicity, or any other unique identifier. All people should be free from unjust public humiliation. Ivan Majdrakoff (1927-2015) was a prominent professor at the San Francisco Art Institute for nearly 40 years. This painting was completed by him in 1947 as a senior graduation project at the Cranbrook Academy in Detroit from which he graduated. Strikes are a frequent subject for labor art. Indeed, the right of workers to organize for bargaining purposes and to strike in support of those efforts are generally regarded as basic freedoms in any democratic society.